We headed out for a team dinner after the medals were handed out. Upon arriving in Perth, Dawn and Lea met a woman on a shuttle who told them about the restaurant where she worked, the Blue Duck. So that's where we went for our final dinner all together. To The Blue Duck. It was hysterical to learn that the restaurant was across the street from where Jenni and I ended up on our Accidental Bus Tour earlier that week. There were more laughs all around as the team finally got see what we'd already seen. The view of the Indian Ocean is amazing along that route. It was even gorgeous from inside the restaurant. We met up with one of the judges and her husband, the Edwards, along with Laurette's mother, Norma for an entirely pleasant evening. This statue was part of the decor at the Blue Duck. Jenni and Lindsay grinning it up. All together for a change! Beginning on the left and going back: Norma, Natalie, Stephen, Jenni, Lindsay, Karen, Pam and her husband, Lori, Dawn, Lea and Becky. ...in an aquarium. It was all very sad. But the sadness was soon forgotten as we headed back to the bus stop. The restaurant was right on the Indian Ocean. I just had to say goodbye. Lea and I rushed down to the surf. And I fell in. We were trying to touch the water, but a wave came in too fast. Lea scampered back, but I tripped on a pile of sand and landed right on my rear end. So the wave I was trying to keep off my shoes was suddenly on my behind. Lea was dying laughing watching me try to get out of it. I can't believe the rest of the team missed it. The both of us were cracking up the entire way back to the apartment. And just like that, the competition portion of our trip had come to an end. We got our luggage from Dawn's place and took a cab to the airport for our midnight flights. Karen and Lindsay were off to Sydney while Jenni and I were off to Cairns. All too soon, we reached the final day of competition. The day dawned bright and early for Jenni and Natalie who were scheduled to swim their duet free between 8:15a and 9:30a. They headed to the pool early so they could get warmed up. The rest of us weren't too far behind because we were checking out of the hotel before we left for the Stadium and needed to make sure everything was packed. I headed over to Dawn, Lea, Laurette and Becky's apartment with Karen and Lindsay to leave our luggage since they were checking out later. We headed for the pool. 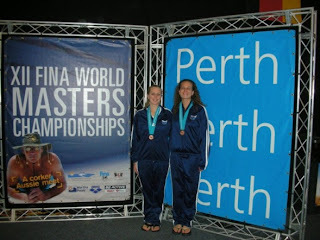 Natalie and Jenni swam third in their age group. We arrived in enough time to cheer them on from the stands. Once their final scores were in, they took 7th in this toughest age group. Way to go, ladies!! Next up were the trio free routines. Karen, Lindsay and Lea did a marvelous job defending our trio title. They brought home the gold for the 6th Worlds in a row. Karen, Lea and Lindsay posing with their gold on the medal stand. 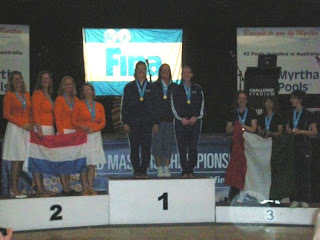 They awarded the medals for the 20-34 age group first. The Canadians swept those top three spots. As you can see, a team from the Netherlands is on the left and a team from Italy is on the right. We didn't have a flag, so some helpful woman from Canada offered us theirs. She was shocked when they refused. She couldn't imagine that we were from the States and Canada didn't have any winners in this group. The team free routines ended the competition. They had some really tough competition here because they were competing in the 20s age group. 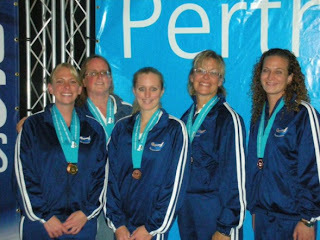 Additionally, they were competing against teams that had 6-8 swimmers. Without the full 8 you're going in behind the curve because you've already lost points. Despite all this that was against them, they came out of this battle tied for third with Durham Synchro, a team who had 7 swimmers. Karen said later that she was the proudest of this bronze medal because she'd never gotten one for team at Worlds before. It only made it that much sweeter to get it while competing against "kids." After the awards were finished, we hung around and take pictures. Here're Lindsay, Lea, Jenni, Karen and Natalie. Lea, Lindsay and Karen cheesing with their gold. After all was said and done, we had a really good showing at Worlds. After watching some of the other teams, we analyzed their routines and are adjusting to make ourselves more competitive. Back in the pool I go! The previous night at dinner, while I discovered my intense love of Australian BBQ sauce, Becky showed us pictures from her trip to Caversham Wildlife Park. The koalas and kangaroos were so cute that we immediately planned an outing there the next morning. However, business weighed heavily on us and we decided to work on our free routines instead. Karen finally finished writing her routine that morning and showed off her unKarenlike move for Jenni and my approval. Then we set out to gel my hair for the very first time. As you'll see in the soon to come videos, we swim free routines in costumes and makeup and headpieces on gelled hair. I should probably mention that it is NOT hair gel. It is Knox gelatin which hardens your hair to keep it in place in the water. Oh yeah...and did I mention that the gel is made of horse hooves? That's why we prefer Knox. It smells...less bad...than the off brands. Karen used her "forty years of experience" to perfectly gel my hair. She arranged the headpiece I'd made with beads and thread - as opposed to the wire I'll use next time - around the bun I'd managed to put in off center and it looked fabulous! You'll just have to take my word for it because I was so excited and forgot to get a picture. Jenni and I gelled Karen, Karen put Jenni's headpiece on her and we set off for the pool. Of our group, Jenni was first up with the 20s age group. She swam 7th. Solos seem to be trending toward darker music. Jenni stayed true to her sunny personality and swam to a "happy" song which definitely set her apart from the rest. As always, Dawn is a fount of knowledge. Jenni's choice was a good one because "blondes don't tend to score well when swimming darker music." Who knew? I swam 5th in the next age group. After those low scores on the tech routine, I really had nothing to lose. I was firmly in last place. While I was waiting, I made the decision to go out and give it my all. In my tech, I'd taken out all the difficulty in favor of the technically sound and got creamed for that. My free was a whole different story. About a month and a half before we left, Dawn had moved one hybrid from the end of the routine to the beginning. After many tears and much panic, I finally got it down. Maybe. I got the go ahead to take my position and climbed into the pool. In true Lori fashion, I didn't put the noseclip on until I'd swam out and was set. I actually had to hold up a finger for the referee to wait for me to put it on. I'm really looking forward to a competition with no noseclip issues. The music began and I gave it my all. I grinned my little heart and covered the pool as best I could. The night before, Lindsay and Karen complimented me on one of my strokes. Karen was actually considering borrowing it. How flattering is that? So when I got to that section of the music, I had a total brain freeze. Luckily it was only for a brief second and I got back on track. I finished the routine, grinned some more, climbed out of the pool - I was done! As soon as that video turns up, I'll post it here. Next up was the 40s age group and Karen's battle with Carol. Carol went first. Karen was 2nd. Her routine was thoroughly amazing in true Karen fashion. I'll post it when it turns up as well. Karen was a walking illustration of honesty during the trip. The night before, she found a camera in the stands and turned it in. The French guys to whom it belonged were so thoroughly grateful that they made sure they took some professional shots of her routine. They were so cute. They would not move from that area until they were sure they got Karen on film. Lea, the team trooper, went 5th. She'd gotten some comments on her tech being done too much with one arm. So despite the excruciating pain in her shoulder she pulled out all the stops for her free. Sylvia was last up on our team to swim. We gathered in the vendor area for the awards. Karen took silver because Carol's routines were more contemporary. She's already looking forward to the rematch even though it won't be for another four years because they won't be in the same age group when we go to Sweden. Lea fought through her injury enough to earn the bronze. Because of the bogus penalty, Jenni ended up in 8th place. Sylvia took 5th. And I, in the shockers of shockers, ended up 10th. One judge was blatantly scoring swimmers from her country higher. My cousin likes to call it their affirmative action. Except it totally backfired on them. High and low scores are tossed. Because of that I was blessed to score higher than one of that country's swimmers for the #10 spot. After Swan Bells, we all made our way to the pool for the Duet and Team Tech competitions. I was very happy to have "dry" day and cheer on my teammates. First up were Natalie and Jenni in their Duet Tech. Can you believe these two just learned this routine a few short months before the competition? Well done, ladies! You may have noticed common elements in all of these tech routines. That's because four figures, split to walkout, porpoise, 2 ballet leg positions and a huron thrust, must be performed in the listed order. Depending on the type of routine, solo or duet/trio/team, you must also have a connected action. In all the techs, you have to show propulsion with an arm in the air. In the team techs, you must show a sequence, straight line and circle. And you have to do it in under 1:50 seconds for duet/trio/team and 1:30 for solo. In the midst of all these requirements, you have to find a way to be interesting while doing the exact same elements as everyone else. Now that you have an idea of what to look for, here's the team tech for your viewing pleasure. It also helps to have really good music that won't put the judges to sleep. 'Cause they have been sitting there for an awful long time. Speaking of the judges...one of them complimented our team as being the most technically sound. Tuesday morning we decided to visit Swan Bells which is known as the largest musical instrument in the world. To celebrate Australia's bicentenary in 1988, England gave the bells to Western Australia. The building you see at the left was built to house them. Originally, the bells were housed at St. Martin-in-the-fields in the church of Trafalgar Square. After 270 odd years, they were getting too heavy for the church's foundation. Every time they rang, it would crumble. To save the church, it was decided to melt the bells down and cast new ones. A patron of the bells campaigned to have them moved instead. Armed with 2 for 1 admission coupons, Laurette, Natalie, Becky, Jenni, Karen, Lindsay and Lori headed off to view the bells. Silliness ensued as we pretended to be swans in front of the tower. Since time was limited because the meet began that afternoon, we decided to start with the observation deck on the 6th floor and work our way down. We admired the spectacular views of Perth and the Swan River while taking lots of pictures. Lori, Karen, Lindsay, Jenni and Natalie grinning away. Karen, Lori and Lindsay with the Swan River behind us. Lindsay went "artiste" on us. Looking straight up from the deck. View of downtown Perth from the deck. A lady who worked at the Bells asked if we'd seen the bell ringing demonstration, yet. We told her we hadn't since we started at the top and the Ringing room was on the first floor. She highly recommended that we see the demonstration then come back up to see the bells. We're easy. So that's what we did. As we walked into the ringing room, the first thing I noticed were all these thick ropes hanging from the ceiling. Of course they got more interesting as the woman who greeted us said her hellos mixed with lots of "Don't touch the ropes." As we all sat in the chairs around the room's perimeter, she explained why we shouldn't touch the ropes. "Tourists tend to hang themselves if they touch the ropes." Since I didn't fancy dying in Australia, I didn't touch the rope. Once everyone was seated, she grabbed a rope and started telling us about the bells as she rang one of them. So happens, there was a Bell Ringers convention in town that weekend so there were two other ringers in the room and another came in with us. Each of them grabbed a rope. Under the woman's direction, they rang "Three Blind Mice" for us. After the other ringers were excused to get to know the newcomer, the woman continued the demonstration. "Wanna see me ring a bell the size of a small car?" She asked. She hopped up on a box and grabbed this huge rope. She rang the huge bell. She was so tiny and the bell was so big that I was convinced she was going to go flying at any moment. But she didn't. Then she asked if we wanted to ring the bells. Despite the whole, "you'll hang yourself if you touch the rope" warning, we were eager to give it a shot. I was first. I gotta tell you, those bells are HEEEAAAVVVYYYYY! She made it look so easy, catching different parts of the rope depending on which number ring she was on. I was doing good just to keep a hold of the rope at all. She started each of us ringing one by one. I was exhausted by the time she got to the last person. To get out of ringing, I took pictures instead! Here're Natalie, Jenni, Laurette, Karen and Lindsay giving it a go. See how the ropes are fatter at the top? The bell ringers would catch that part alternating with the skinny lower part on even and odd rings. Laurette, Karen, Lindsay, random chick, Becky happy to take a breather. Here are all of us with the Bell Ringer. Karen, Natalie, Jenni, BR, Lindsay, Becky, Laurette and Lori. See how tiny she is? She has to be freakishly strong to be able to ring these bells for any length of time. Our amazement only grew once we went up to the Belfry and saw exactly how big these bells are. No wonder these bells can kill you. Look how HUGE they are. Here're Lindsay, Lori and Karen marveling at the size. The ones closest to us are the small bells. Those are the ones we got to ring. The bells are purposely "set" in the up position like this. This means that they are ready to ring. Our Bell Ringer told us how she can distinguish a real ringer from a wannabe. She tests them by having them set a small bell. If they can't do it, she won't let them ring. After this amazing trip, I have gained a whole new respect for Bell Ringers everywhere. Before we left, Karen found a wallet in the restroom. She turned it in and the people gave her a 10% discount on her souvenir purchases in the gift shop. Who says honesty doesn't pay? At this point, the group split up. All to handle last minute details before the solo and trio techs that were scheduled for that afternoon. The solo and trio techs were scheduled for Monday afternoon. Because it was such a small meet, the events didn't actually begin until 2:30p. A bonus of the extra time was that everyone had a 45 minute Open Solo training that could be used however you wished. The meet began with the 80+ age group and went down from there, so Jenni and I hung back at the apartment since we were in the last group to warm up. Apparently, we shouldn't have been left to our own devices because we kinda got lost on the way the pool. What had happened was....Lea figured out a more efficient route to the pool via the bus system. She sent it to Jenni in a text message. All we had to do was walk up the street a bit and flag down the bus as it came along. "It would take us straight there." First, we totally missed the crosswalk. Thankfully, there wasn't a ton of traffic on the four lane highway that was traveling backward. It's the weirdest thing. You never notice how ingrained it is to check to the left first when crossing the street until you have to remember to check right. We made it across safely and flagged down the correct bus. Jenni was listening to her ipod as is her custom before competing and I was checking out the parts of the city we hadn't seen yet. When we got to the familiar Claremont train station, Jenni and I kinda waved at it, glad that we didn't have to transfer there. You know, 'cause we're headed straight to the pool. We admired neighborhoods, huge front lawns that had sidewalks set back a ways from the street, and a gorgeous array of sun beams that streaked the sky over a very picturesque Indian Ocean. Along the ocean, the bus stopped. For some reason, everyone got off. Including the driver. Silly me didn't think too much off it. From where I was sitting directly behind his caged in seating area on the right, it just looked like he was adjusting his mirror. Still, I asked Jenni if she thought we should confirm with the man that his route would take us to Challenge Stadium. She agreed and tried to text Lea. When the guy got back on the bus, I asked him about the pool and he gave us this startled look. He totally thought the bus was empty. We're just sitting there, a couple of confused Americans. He said no, we needed to get off at Claremont. We were at the end of the line and he wasn't fixing his mirror. He was turning his sign to Out of Service. It was his break time. Jenni and I just stared at each other for a few "oh crap, what do we do now" moments. Lea wasn't answering her text messages. We were at a loss. However, just to show you how wonderful the Aussies are, the driver fired up the bus and drove us back to Claremont station so we could catch our connection. After many profuse thanks, we hopped on the shuttle and got to the pool. And we weren't even late. The competition began! A judge was late arriving, so Dawn had to fill in during the oldest age groups, but she was all coach again by the time Sylvia swam. Next up was Karen's nemesis, Carol Fitzsimmons from the Calgary Aquamums. Lea, who'd been battling a shoulder injury, swam next. Karen was the final swimmer in the 40's age group. Everyone was a bit disappointed at how low the scores were. It wasn't long before we realized that the scores were just low in general. I was the next Unsyncable to swim. I went 7th in my age group. I gotta say, hearing those low scores really hurt even though you know everyone is getting them. Finally, Jenni swam 12th in the 20s age group. We found out the next day that she got a penalty for going over the allotted 10 secs on her deck work. But as you can see from the video, she was absolutely in the water well before the 10 seconds were up. The best we can figure is that the timer started the stopwatch from the whistle instead of the music. Unfortunately, you have to contest these things within a half an hour of the score posting. Even though we found out about it late, Dawn still tried. But they wouldn't budge on the decision. The trio techs ended the day. Lea, Karen and Lindsay had an awesome swim. We headed back to the apartment where it was Lindsay's turn to cook. Karen helped her out since it was salad night and she makes amazing salads. On the shuttle back to Claremont, Jenni and I told the team all about our earlier bus adventure. Amid much laughter, Lea clarified that, "it would take us straight there" meant to Claremont, not Challenge Stadium. Adding to the hilarity, guess who was our bus driver from the train station back to the apartment. I only wish I hadn't been so embarrassed at first then laughing too hard the second time to get his name and picture. I'd love to show you all who the nicest man in Australia is. It was getting late by the time we left the prison, but we wanted to go down to the Indian Ocean since we were so close and didn't know if we'd have time to make it back. We said goodbye to Natalie who had dinner plans and set off to find the beach with Lindsay leading the way. I have to say that Lindsay is amazing when it comes to touring and finding your way around. She had sights, walking tours and maps all within easy reach the entire time we were in Australia. Between her and Karen with her guidebooks, I was totally content to sit back and follow along. It was dusk by the time we made our way to the beach. Along the way we passed a yacht show and lots of ritzy looking seafood restaurants. But right on the corner of the boardwalk closest to the ocean was... wait for it....McDonald's. They even had a playground. Go figure. Looking away from McDonald's toward The Round House. You can just see it slightly right of center. Lindsay, Lori, Becky and Karen walking toward the water. We had fun trying to get shots of us touching the water. With the waves coming in so fast, it was a little difficult to time right. Still, the water felt super warm. Almost like bathwater. I was really surprised. Guess that's what I get for living on the Pacific Coast in California. After this little adventure, we headed back to the train that would take us to Perth. It was Karen and Sylvia's night to cook and the competition was to begin the next day. All of us headed up to the prison shown here where we got information on the available tours except Dawn and Lea who needed to get back to Perth. Due to our practice time, we could only make it back to the Great Escapes Tour. We bought our tickets before leaving so we wouldn't have to worry about it later then went to the pool. Our tour group dwindled to Karen, Lindsay, Becky, Jenni, Natalie and me and we arrived just in time to make the tour. We were taking pictures in the souvenir shop when our surly, fast talking guide showed up. You could feel his disapproval that we'd missed the basic tour and dared skip ahead to the Great Escapes. But he got over it. I guess. Those things that look like holes are actually spikes nailed into the hardest wood they could find to keep ole Joe inside. The warder even made a deal with the guy. He told him if he could escape this cell, he'd give him a pardon. As time went on, Joe started looking sicker and sicker cooped up as he was. The prison doctor advised the warder that Joe needed fresh air and exercise or he'd die. The warder relented and gave Joe a pile of rocks and a pick ax to break out in the yard. Near the outside wall. I'm sure you know where this going. Joe piled the rocks up as he broke them until it was taller than he was then started on the wall. The guards were used to him by this time, so they didn't bother to check the other side of the rock pile until after ole Joe was gone. Two years later, they did recapture him by accident, but the warder didn't give him the pardon because the deal was he had to escape from his cell. Not the yard. The best escape had to have been done by John Boyle O'Reilly. This guy nearly caused a war between the U.S. and Great Britain with his little escapade. And he's the only prisoner they were never able to recapture. Mr. O'Reilly was a Fenian political prisoner since he was an Irish spy in the British Army. He was sent to Fremantle with six other Fenians. This guy made nice with the warder and with the help of the Prison Priest escaped on a whaling ship. He made it all the way to Boston where he joined up with other sympathizers, bought another whaling vessel, the Catalpa, and returned to Fremantle to free his fellow Fenians. to get the message to the remaining six that they were to make sure they were outside the prison walls without their guards during their work detail on Easter Monday morning because apparently they were frequently without their guards outside the prison walls while on work detail. The six did as they were instructed and hopped on carriages sent to pick them up. They were taken to the small whaler that would row them out to the Catalpa that was waiting for them in International waters. Of course, the British were on to them immediately, but couldn't catch them in the whaleboat. After spending the night in the open boat during a squall, the prisoners made it to the Catalpa. By this time, the British had found them again. They demanded to board the ship and retrieve the prisoners, but the captain refused. The British prepared to fire on the Catalpa. The captain told them , "That’s the American flag. I am on the high seas; my flag protects me. If you fire on this ship you fire on the American flag." Since the British had just lost a similar case costing them 3 million pounds - that was a whole lot in 1876 - they weren't eager to repeat the situation. They had no choice, but let the Catalpa go with the prisoners on board. Mr. O'Reilly returned to Boston where he was a newspaperman and regularly went on lecture tours. He wasn't even trying to hide out. When he died in 1890 his funeral was the second largest in American history. Only John F. Kennedy's was bigger. Oh yeah...and they wrote a song about the Catalpa escape. Unfortunately, until insanely recently it was still illegal to sing it in Australia. This is the side of one of the cell blocks. The round doodads are there to keep prisoners from climbing up to the roof and escaping over the outside wall. The pipe itself was kept coated with a thick grease. Except, he didn't get enough handles and he was running out of time because they were going to need the buckets pretty soon. So, he decided to strip off his uniform and wrap it around the razor wire and climb from there. It might've worked except, his handles broke before he reached the top. He tumbled back down through the the razor wire and landed in a heap on the concrete another seven feet or so below. This is the guard tower from where they weren't watching Razor Wire Boy. On to my favorite escapee! Mr. Brenden Abbott, the Postcard Bandit, was assigned to work in the tailor shop of the prison with a couple other inmates. Guess what they were making. Yep. Guard uniforms. They got the bright idea to make themselves a uniform and escape. Since the guards had rifle practice on the range right behind the tailor shop, Abbott and crew knew when they were there. Once day, when the coast was clear, they put on their guard uniforms and hustled to the roof to go over the outside wall. To get to the wall, they had to jump a good 7 to 8 feet across the rifle range. Abbott and one guy made it. But the third was ahead of his time in fashion and didn't have enough room in his sagging britches to make the jump. He smacked into the wall and slid down it to the ground. If that wasn't enough pain, he caught his kneecap on a water faucet and nearly ripped it out of his leg. The faucet didn't fare much better as it was dragged down through the wall leaving a nice little hole. They had to move the faucet about a foot to the left to replace it. Needless to say, the guy wasn't exactly quiet which alerted the guards to the escape attempt. They were able to catch the 2nd guy fairly quickly, but Abbott was long gone. The part I love...the prison was decommissioned in 1991 and opened for tours in 1992. Abbott took a tour in '92 and had the audacity to sign the guest book. Yes, he was still wanted by the authorities. For his current address, he wrote, "Nowhere you'll ever find me." Except they did. He's back in prison, but they only recovered about a $100,000 of the $5M he stole from banks over the years. Maybe it's just me, but I think he should've hid wherever he put the money! On to the Women's side of the prison. They didn't have it as good as the men. This was their bathroom where they were allowed one cold bath a week. It was three prisoners per tub of water. Compared to these tiny little cages that the women had as their yard, the men were staying in a Hilton. Four women were assigned to each cage with only a bucket of water to drink and another bucket for other bodily functions. They were left outside in the sun all day unless they had a job in a small airless room. They women rarely escaped because most of them were in for crimes like prostitution that only had a sentence of six months. Time was added if they tried to get out so it just wasn't worth the effort. Stairs leading up to Moondyne Joe's cell. On Sunday, we headed down to Fremantle to the market. Becoming pros at the whole transportation thing, it was pretty easy for us to catch the train to Fremantle. Since we were planning to be away all day with the heavy duty sightseeing with a short break for practice, we were advised to travel light. The weather in Perth was Schizophrenic, as Jenni liked to call it. It would rain in the morning, but would clear up before noon. So by the time we'd gotten to the train, the rain was gone. 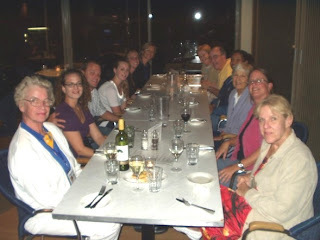 Everyone, Dawn, Lea, Laurette, Becky, Karen, Sylvia, Natalie, Lindsay, Jenni and I went along for this excursion. I really have to give it to the Aussies. They tend to express things in a much less watered down manner than we Americans. I saw my favorite example during the train ride to Fremantle. To give a little background, the train is not elevated and there are gates near the stations for pedestrians to cross the tracks. Of course this leads to lots of bright yellow warnings signs with black letters about crossing when a train is coming and the $250 penalty incurred if you get caught. But my absolute favorite warning sign that was posted along the tracks said, "Your family won't have to worry about scattering your ashes. The train will do it for them." Isn't that fantastic? I tried to find it again to get a picture, but couldn't. At the market, I saw my first ever boomerangs and Didgeridoos. I also had my first Bratwurst. Nothing like having your first German food in Australia. As we headed back to the train, Karen stopped for a chocolate croissant. Then we split up into two groups. We needed to get to the pool for practice, but we also wanted to come back and tour the Prison. Since we were staying in this fabulous apartment/hotel with a full kitchen, Karen suggested that we break up into groups of two who'd be responsible for cooking dinner each night. Jenni and I volunteered to go first. As a group, we went on this massive grocery shopping spree to Woolworths. Yeah, I know. It's not a five and dime in Australia, though. Along for this grand adventure were Lea, Dawn, Becky (our honorary Unsyncable from Colorado), Laurette, Karen, Sylvia, Jenni and me. Jenni and I decided on fajitas. I got the chicken and she got the tofu since she's a vegetarian. We both split the peppers, onions, salsa, cheese and tortillas between us and was ready for our cooking extravaganza. Wanting breakfast, I found some ready made pancakes that weren't even refrigerated, much less frozen to try. Something else I though was cool were then individual servings of ham slices for sandwiches. Although, it's less cool now that I've seen them in Albertsons here in the States. Jenni and I wanted to split some Doritoes, but the flavors were different. We picked a bag by the color and hoped for the best. Of course it worked out to be exactly what we wanted. The two of us finished fairly quickly and ended up waiting just outside the store for everyone else. Due to the way it was constructed, we weren't truly outside. The shopping area was almost like an outdoor mall, but Woolworths was set back inside a a good sized alcove behind the gym entrance which was beneath it. While Jenni and I waited, we couldn't resist the corner bakery that right there tempting us with its carbohydrates. I tried a pizza like concoction while Jenni opted for pastry that was stuffed and sweet. Either way, we enjoyed them while the rest of our team slowly joined us. I was so thankful on the trip back to the hotel that we'd selected the fajitas. Between us, Jenni and I had only 7 bags. Poor Sylvia had at least 8 by herself. She was partnered with Karen who had maybe 5 or 6. I helped Becky with her bag of condiments never even realizing how attached I'd become to that yummy BBQ sauce. After much juggling, we made it to the hotel and stored most of the food in our apartment. Karen and Sylvia grabbed a quick bite to eat and headed back to the pool with Dawn, Lea and Laurette. Karen was interested in attending the Technical Meeting. I'm not sure why Sylvia went. Jenni and I relaxed in the room until time for us to head to the pool for our music practice time. Natalie and Lindsay met us at the pool since they'd just gotten in that day. The team practice revealed another problem. The pool wasn't long enough. Every time they swam through the team routine, they'd run into the far wall - which was actually a lane line that divided the synchro section from the diving section. Determining that the length wasn't regulation, we moved the lane line back. What's with us decorating the pool all the time? The team tried the lap again. And still ran into the lane line. At that point, Lea and Karen finally had a reason to have the "younguns - Lindsay, Natalie, Jenni" slow down. After practice, Jenni and I made our fabulous fajitas while everyone, except Natalie who had her parents and boyfriend along, sat around and chatted. All in all, the evening was lovely. After the long travel time and losing a day, I was a bit worried about not being able to adjust to the time change. Between missing the connection, trying to get to our hotel and practice that night, there was no reason to be concerned. We were all well and truly exhausted by the time our first day ended. Once we figured out how to get to Mounts Bay, we only had time to drop our things and catch our breath before heading back to the Stadium for our allotted practice time with music. We were told it was scheduled for a bit after 8p. During the bus/train/bus ride Lea figured out that we'd be stuck at the Stadium because the bus that left from there stopped running at 9p and there was no way we'd be finished by then. We rushed poolside to confirm with the PowersThatBe that we would have a ride back to the train station at least. That's when we discovered our other problem. We'd actually missed our pool time. The organizers moved our time up, but never got word to us. The staff who was still at the pool agreed to give us an abbreviated time right then and agreed to hold the bus for us since it was actually a dedicated shuttle. Slightly relieved, we hopped in the pool and sped through our routines after an abbreviated warm up. Needless to say, we were all looked a hot mess. Still, after the long day of travel, the water felt marvelous. But we found some more issues. I never realized how much I depend on the black lane lines on the bottom of the pool. The competition pool didn't have any. The bottom was made up of tiles. With no lane lines. It pretty much became a toss up if you were heading in the right direction. Especially after a spin. To try to solve the problem, the organizers let us move the flags to the middle of each wall in hopes that it would be enough to guide the competitors. After we'd finished decorating the pool, the shuttle dropped us off at the train station, but we took a short detour to the incredible smelling Italian Restaurant across the street. The food was excellent. I had this super delicious plate of lasagna. The only thing about it that sucked was that said lasagna set me back $30. The exchange rate didn't even make it better since it had been dropping for months and the Australian dollar is nearly equal to ours. Still, that was some pretty good lasagna. Feeling much less grumpy, Dawn, Lea, Jenni, Karen and I headed back to the hotel.